Ruland realised for the Plantextrakt GmbH & Co. KG in Vestenbergsgreuth a process plant for pasteurisation of herb and tea extracts. 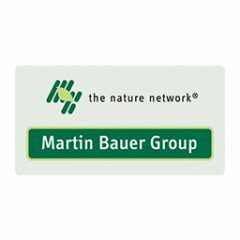 Plantextrakt is a business unit of the Martin Bauer Group and a world leader for tea, fruit and herb extracts generation as well as decaffeinated black tea and decaffeinated green tea. Another business field is the generation of tea aroma. All in all, the company provides more than 2,000 individual recipes based on more than 120 different plants. 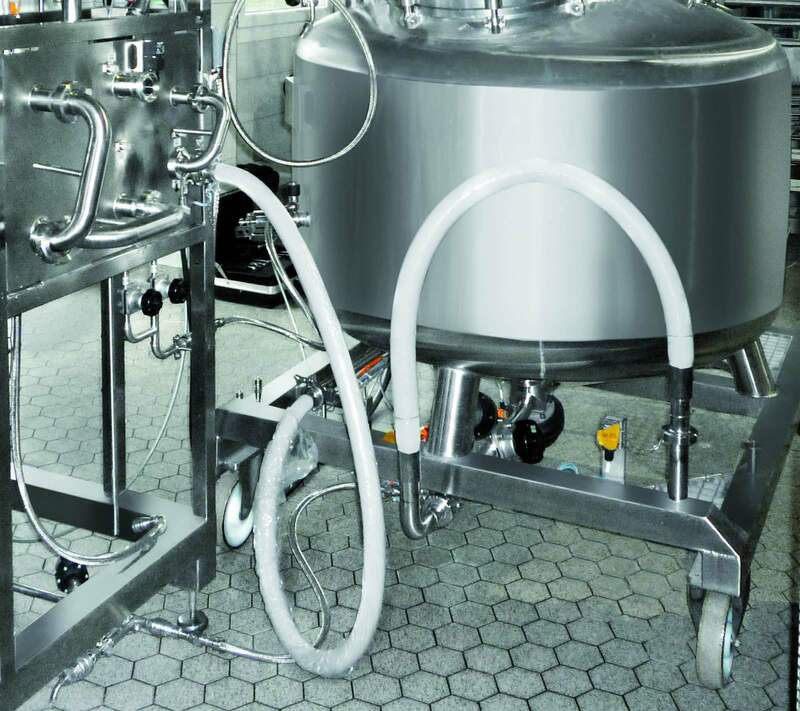 To enter new markets with the existing products, Plantextrakt wanted to expand the production area with a pasteurisation and following aseptic filling. In a consulting project, Ruland and the customer developed a three stage concept to expand the production location. The interesting task during consulting was the coordination of the discussion with all the Plantextrakt departments. The pros and cons of various demands from different departments were discussed and the design parameters for the new production area defined, like quality increase by using aseptic container, small batch sizes, frequent product switching, high product viscosity, smallest possible product loss. During the realisation phase for the site extension a new production hall was built next to the existing mixing area. To facilitate a uniform supply management, RULAND planned the energy pipelines and their alignments by 3D modelling into the new building. The possibility for later extension and a further new construction is included in the plans. 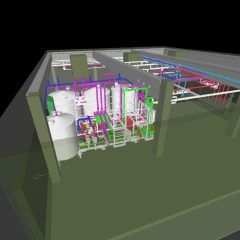 The implemented process plant consists of a heating module with connection to the existing mixing, a 6,000 l sterile tank, two mobile containers, a CIP plant, a combined double station for cleaning and sterilising those mobile containers and a double cleaning station for 1,000 l plastic containers. Either from the sterile tank or from a mobile container, the products are aseptically filled by a bag-in-box filler. The heating line of the first construction stage was realised as a piggable plant with a capacity of 500 l/h. This met the demands from consulting best. The low production speed of 500 l/h leads to small diameter of the production piping (here DN 20). Larger diameters would lead to a reduced heat exchange because of worse flow conditions. Even smaller diameters would lead to increased pressure loss, which in turn would require more powerful heat exchangers and product pumps. To get the correct specifications for the heat exchanger, tests were run on a pilot plant early in the project. Many Plantextrakt products have a relatively low water content (50 to 65% dry substance) and have to be protected against fresh water or condensate during treatment in the process plants. The solution is to ‘encapsulate’ the product using pigging technology at the start and end of production. For the smaller pipe diameters, a special pig was developed. The heater can be fed by either of two ways. For larger batches up to 6,000 l there are tanks in the mixing area. From there, the product is transported by a transfer pipeline to the supply container of the heating module. Pigging technology is used as well to avoid mix phases. At the end of production, the pig is moved using pressurised air. This ensures water not getting to the product, because the product piping is dry before as well as after production. With small batches up to 1,000 l, mobile containers can be filled in the mixing area and docked directly to the heater. This helps minimising product loss stemming from product sticking to container walls or hose connections. Via interface, the mobile containers are connected with the controller and are fully automated. All hose connections critical to the product are supervised by the control. The sterile status and system pressure for the heater pump are supervised and controlled with the help of a pressure sensor. Also, the actors may be operated manually at the control box of the mobile container. This way, the mobile containers can also be used where no connection to the control is possible, e.g. pilot plant stations. The mobile containers are also used as sterile tanks. This allows for small batches to be pasteurised from one mobile container to another. Then they can be stored intermediately before being given clearance for filling. Of course it is possible to simultaneously fill from one end and to drain to the filler on the other end, like with any other sterile tank. For cleaning and sterilising the mobile containers, a CIP/SIP station provides room for two. Here, the containers are cleaned and, if warranted, sterilised by pure steam, all fully automated. After sterilisation, the condensate is blown out and the containers are filled with sterile air. Plantextrakt stores many semi-finished products for mixing in 1,000 l plastic containers and, at times, delivered in those to customers. Due to the varying use of the containers, a thorough cleaning is necessary. Otherwise later fillings could be contaminated. 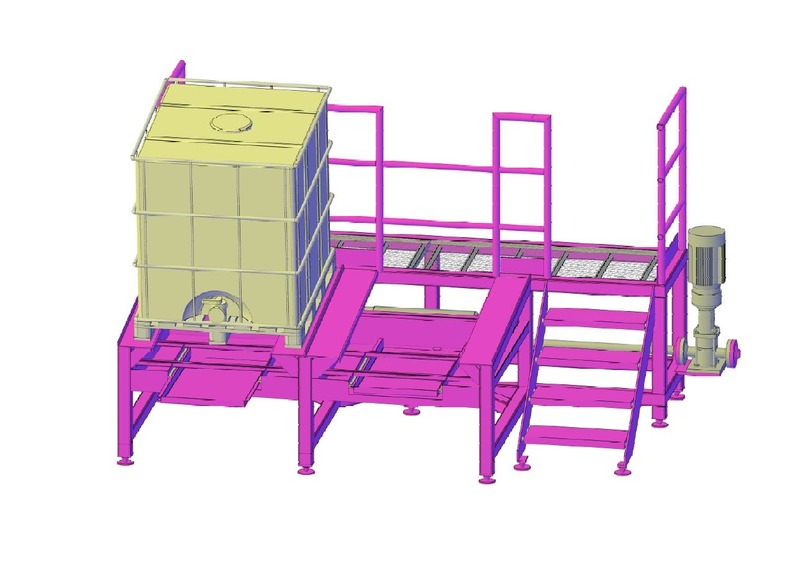 To standardise and automate the plastic container cleaning, RULAND delivered a cleaning station for two plastic containers which is connected to the CIP plant and accordingly supplied with all the media. This cleaning station is expandable to a third servicing point. The four-tank CIP plant with two cleaning circuits is used for the process plants and the CIP stations of the mobile and plastic containers. The plant is expandable to four cleaning circuits. To achieve an optimal cleaning result for all plant components (heater, sterile tank and filler), a recipe administration is implemented. This allows for individual cleaning recipes for all product groups. Supervision and operation of the plant is done by an 19“ touch screen at the heater module and by PC in the control room. Both stations are designed identically to each other and help ease the use of operation by having the same look and functionality. For the food industry, the complete logging of all production steps forms an important quality management part. The batch logging software allows for a very fine tailoring to the needs of the user. At PLANTEXTRAKT, starting with the sterilisation programs, all status updates, alarms, operator input and select diagrams of the individual batches are filed together with the order number. Would you like to know more about our project at Plantextrakt?